Roxiticus Desperate Housewives: Survived the Slumber Party!! London's birthday slumber party was a great success... the girls didn't get to sleep until 2:30 in the morning, so we're all a bit exhausted. Rex and I were pleased to find that London has a terrific bunch of girlfriends... polite, sweet, but FUN! 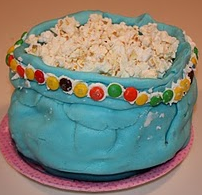 We baked the "popcorn bowl" cake ourselves... we've been practicing since the Christmas holidays and it came out just about perfect on the third try.